The Webley MKVI pistol is one of the best know pistols due to its extensive use in several combat situations, most notably in the First World War, and for good reason to. This model features a rifled barrel and fires the standard .177 lead air gun pellets for outstanding accuracy. 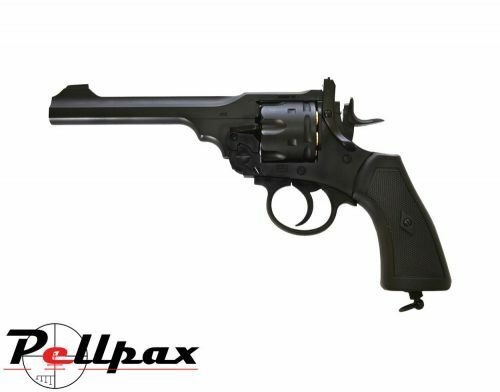 This webley air pistol has a design which is rugged and reliable, and very easy to use especially when reloading. Some other names that it is known by are the Webley Self-Extracting Revolver, and the Webley Top Break Revolver, as the barrel and cylinder hinge away from the grip, which in turn lifts the cartridges out of the cylinder allowing them to be easily removed. This entire action has been exactly copied from the original blueprints to make it as realistic as possible, and with almost everything being made from metal, the quality is absolutely superb. The icing on the cake has to be the original 1915 markings to the frame which make it near enough indistinguishable from the real thing.